From Chris Berman’s NFL play-by-play to Stuart Scott’s “Boo-Yeah!,” ESPN has been home to some of the more unique and intriguing personalities in the media landscape since its inception in 1979. And now, those personalities are getting some behind-the-scenes support from a couple of Edinboro’s own alumni. 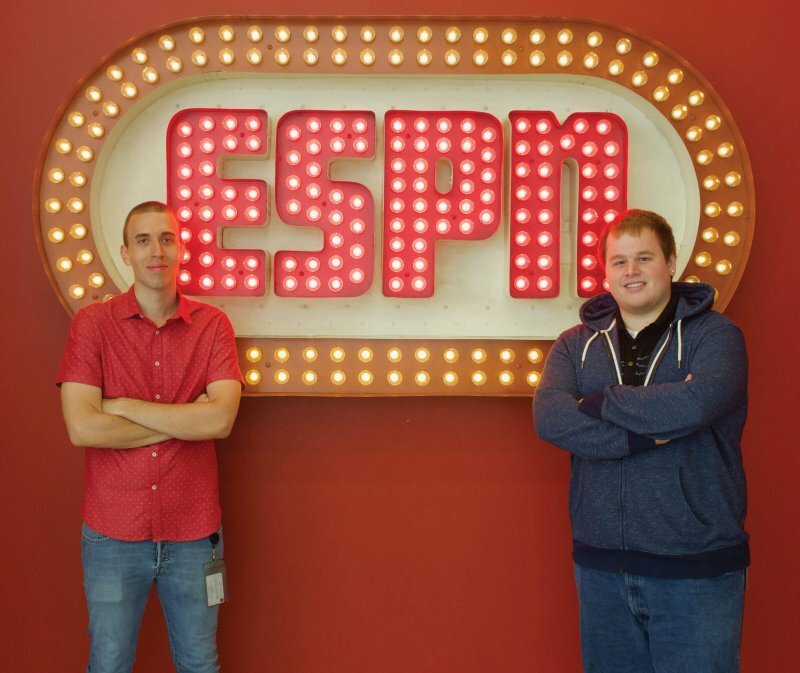 Patrick Nuzzo and Anthony LoPinto, recent graduates of Edinboro’s broadcast journalism program, and Edinboro Television alumni, have both found themselves on the staff at ESPN’s Bristol branch, continuing a friendship from their college days. Following their nomination for work on “Snapchat Discover,” in the category of digital innovation at the 37th Annual Sports Emmy Awards, The Spectator sat down with them to shine some light their journey. Both spoke on the notion of having to wait after graduation, while possibly grabbing those part-time jobs to keep one afloat. “I think one of the biggest takeaways for me was…number one you really have to humble yourself after you get out of school and take things (jobs) that are gonna keep you on your feet and allow you to make some money,” LoPinto said. In the meantime, the two of them were applying for jobs in the broadcast field, and Nuzzo waited for a return trip. They both stayed active, doing what they could to “keep getting them checks.” Finding work where they could, Nuzzo had part-time jobs working at Wal-Mart and a local beer distributor, while LoPinto worked at a local church as part of the event staff and as part of his sister’s paralegal team, helping with spillover work. “Whether it was filing client paperwork or randomly doing some graphic design for a lawyer running for office, whatever it was they asked me to do I did it. I maintained their website too,” LoPinto said. In October, LoPinto will make the move to an advanced video creation role, doing similar work, but with added diversity in where the video ends up in ESPN programming. After spending much of their time at Edinboro together, LoPinto and Nuzzo were both hired onto the Snapchat Discover team, continuing to collaborate. Nuzzo and LoPinto talked of the service, highlighting their target audiences (14-24) and characteristics of Snapchat, such as vertical videos having to be a priority. “It’s really about striking that balance between what’s important for that platform and what are the most important stories that (as) ESPN we feel a need to tell,” LoPinto said. The emergence of social media has changed the landscape of the mass media industry, a change rivaling the invention of the internet. Campus media organizations have taken notice, training students to use it as an engine for their professional life, rather than just personal. “It’s really important for people to make themselves as valuable as possible. If you can fill in, and do a lot of different things well, then that’s only going to bode well for your prospects,” he added. Surreal and intimidating, LoPinto and Nuzzo have had to work through an ESPN experience that could feature a variety of characters. Michael Lantinen is a sports editor for The Spectator. He can be reached at sports.spectator@gmail.com.